This cross stitch stamped sampler adds to the Memories of every generation.It is a Keepsake in the stage of life for every Child , Parent , Grandparent We can all remember being taken to a park for a swing or even better yet having a swing in our yard and Grandfather or Mother visiting us,spending time cherishing the outdoors together. 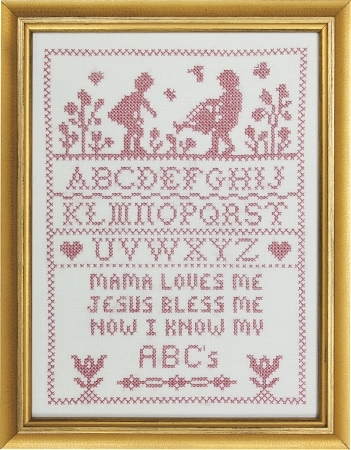 Children's Blessing in pink , a printed cross stitch sampler is a great reminder of a wonderful life that we share. Country Stitching also offers this in blue # 468 for a young boy. All orders have been filled accurately and timely; usually arrive within a few days. Patterns and directions are accurate and easy to follow as is the printing on the fabric. Dimensions are as stated and materials are ample. Kits are satisfying to work as they are not too hard and work up quickly. Finished projects are even prettier and more colorful than the picture. If you love the old fashioned charm of samplers as I do, this website is the place for you! This kit is cute and funny and great for a child's room.